Chrissie has got everything: a devoted husband, three lovely children, her health and a self-owned business. She coaches her daughter’s netball team, is a martial arts practitioner, and has lots of friends. Hardly the person you would pick as a meth addict, but a moment of insecurity and weakness leads to a downward spiral that ends up ruining her life and the lives of all those around her. Chrissie and Dave met in the Navy, and they live in Auckland, where Dave works for another ex-Navy mate, Marty, in his construction business. Dave is also a martial arts expert and teacher, and he coaches his son’s soccer team. 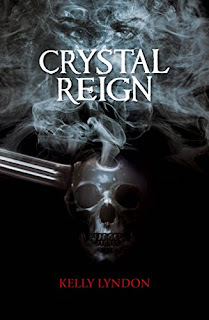 They are at a party when Chrissie takes the fatal first step towards addiction, and CRYSTAL REIGN documents the horror of methamphetamine addiction with no pulled punches. Chrissie’s deterioration is gradual at first, with her assuring Dave she is in control and her use will stop. But then she is more the drug than she is herself and her behaviour traumatises the children and makes Dave feel helpless for the first time in his life – well the first time since suffering from his father’s alcoholism when he was a child. Dave had vowed he would never put his own children through that, but his first reaction to Chrissie’s behaviour it to turn to his father’s best friend, Jack … Daniels. The opening of CRYSTAL REIGN is so horrific that it is possible non-New Zealanders will see it as over the top – but New Zealanders will recognise it as a version of true events. The story is told backwards and forwards in time (chronology markers provided by key sporting events and classic rock concerts), the point of view does get a bit wandering in parts, but the plotting it solid and you really are in suspense as to what is going to happen to the central family that is losing everything. They have few friends who stay loyal to them, but those that do are remarkable. Dave and his eldest daughter Megan are great characters, and through the events they end up supporting each other and the two younger children as mates rather than as father and daughter. Dave is flawed – his ‘locker room’ banter with Marty quite awful – and there is always the worry of how he will use his lethal martial arts skills in dealing with some of the ghastly people that Chrissie has become entwined with. We lose track of Chrissie for large parts of the novel, and the story is focussed on the devastating effects her addiction has on her family, friends and work-mates. The effects on the two younger children are particularly chilling. There is lots of information about meth addiction in the book, and you find out about the legal processes, the rehabilitation options, and community support groups. But none of this is dry or cumbersome, there is a bit of clunky early history added near the beginning, but that is helpful in filling out Dave’s character. Oddly enough there are some funny bits as well! CRYSTAL REIGN is not a pleasant read, but it is a compelling one and one that gets beyond the stereotypes of meth addiction in New Zealand, highlighting the frightening scope of the problem.